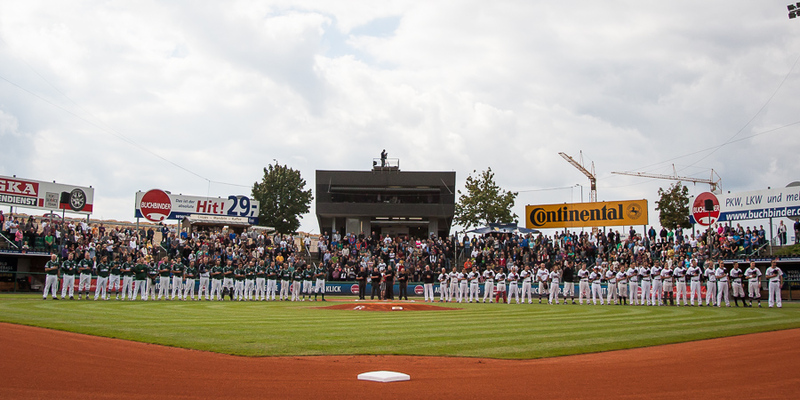 The Solingen Alligators have won game one of the German Baseball-Bundesliga finals. They prevailed 6-5 on Saturday afternoon over the Buchbinder Legionaere Regensburg. A crowd of 1,037 saw an intense match at the Armin-Wolf-Arena. Solingen took a 1-0 lead on Kai Gronauer’s solo home run in the second. Five runs in the top of the fourth put them ahead 6-0. Travis Bass homered. Florian Goetze and Julian Steinberg added two-run doubles. Regensburg got on the board in the bottom of the frame thanks to a solo shot by Chris Howard and a RBI single by Richard Klijn. At the end of the game the Buchbinder Legionaere made things interesting. Michael Weigl drove in Ludwig Glaser to make it 6-3 with a single in the eighth. In the ninth they loaded the bases with one out and Glaser cut the deficit to a run with a two-run single. However a fielder’s choice by Evan LeBlanc and a pop out in foul territory by Chris Howard ended the rally. Andre Hughes, who had lost his last four starts at the Armin-Wolf-Arena with Solingen and the German national team, kept the strong Regensburg offense in check and earned the win with a seven-plus strong innings. He conceded seven hits, three runs (2 ER) and three walks. Robin Drache replaced reliever Theon Bourdanitis to get the last two outs in the ninth. Regensburg’s Mike Bolsenbroek struggled from the beginning and took the loss, surrendering six runs on seven hits in three-plus innings. Boris Bokai replaced him with the bases loaded in the fourth. He wasn’t able to pull off a Houdini trick, but shut down the Alligators afterwards with six scoreless four-hit innings. Game two of the best-of-five series is scheduled for Sunday at 2pm. Legionaere TV will broadcast live.